As mentioned before, I like helicopters. Helicopters? If planes (cutting through the air, inertia and all) were on rails, then a helicopter would be balanced on the tip of your finger; up and down — a tilt, and it moves in that direction. And with that in mind, watch this Oregon Christmas Tree Harvest With Helicopter. One might say ballsy, another confident (and skillful). Below is a more tame go at such a process. A perfectly ridiculous, borderline nefarious game show/social experiment/epic prank. 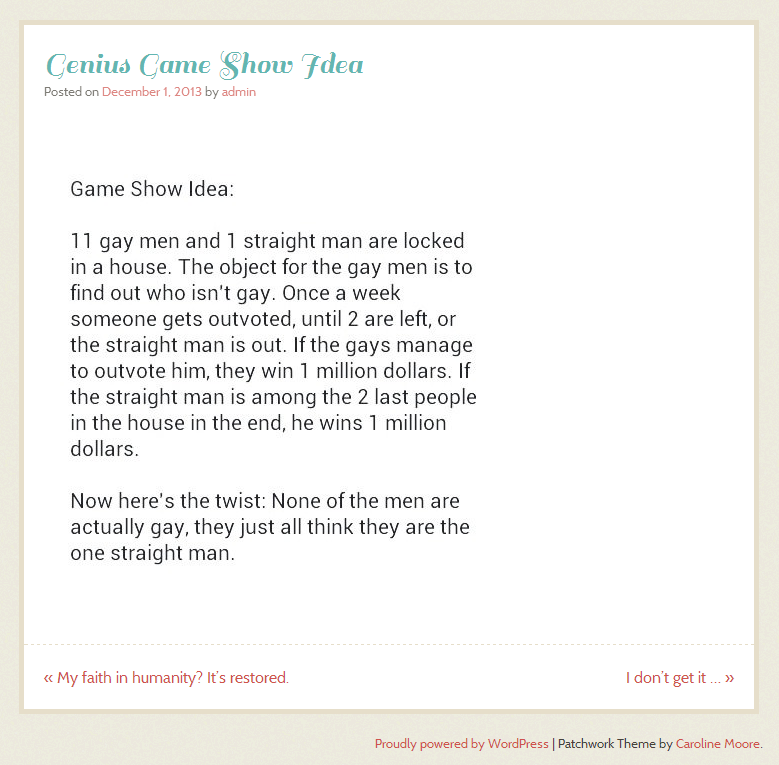 Consider this idea, the so-called ‘Genius game show idea’. And though I enjoy this series (Rick and Morty), I worry about the ethics. Though, the solution to this anxiety (with regard to bringing injury to the creators of something I enjoy), is that I can here promote it. The quality isn’t great, but perhaps that’s a good thing… you… watching it without buying it; you might as well be eating off of their plates! This entry was posted in 2013, Funny, helicopters and tagged funny game show idea, helicopters, reality tv, Rick and Morty. Bookmark the permalink.